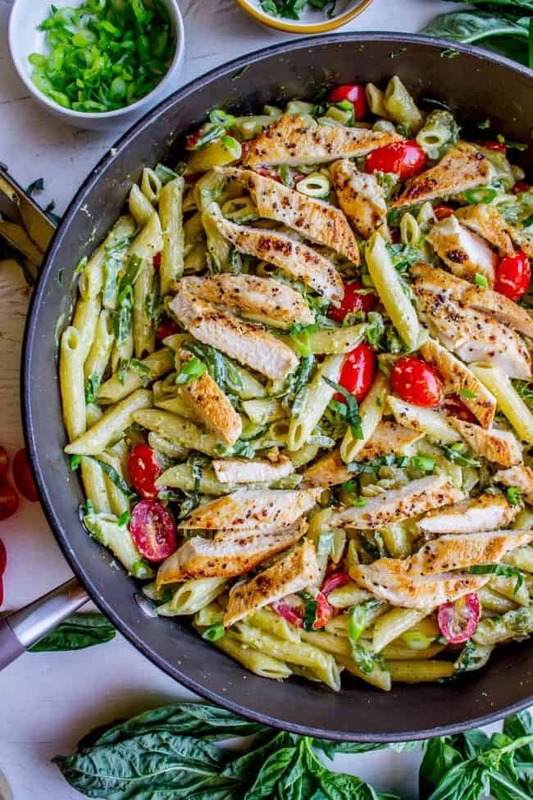 This 30 Minute Chicken Penne Pesto is your new favorite last minute dinner! It’s done so quick, you can even used canned chicken if you are really crunched for time. 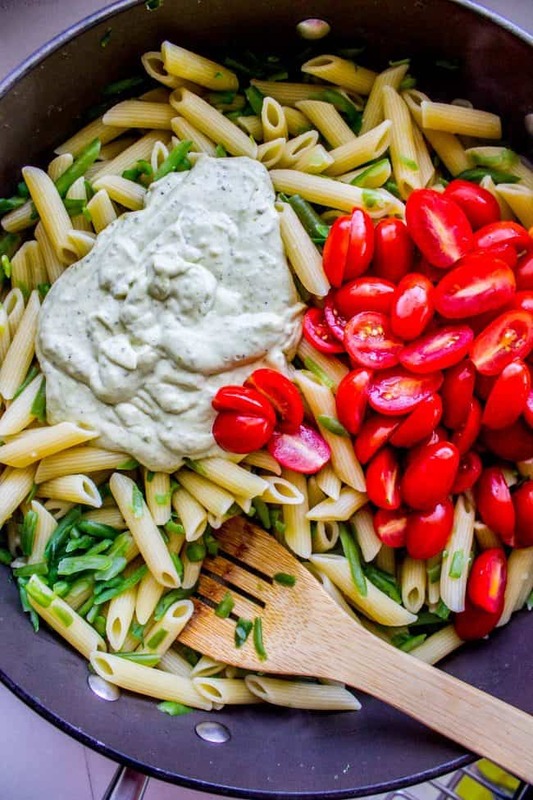 Swap the frozen green beans and cherry tomatoes for whatever veggies you have on hand! Well it’s here guys!!! The Food Charlatan has a fancy pants new design! I’m so excited to finally have a new look for my site. I hope you like it, and that it is a little bit more functional for you. I know it will be for me! Upgrades like this are always selfishly motivated, because I use my site more than anyone else! My blog is a little bit like my home. I hang out here a lot. I wanted to like the space, the same way that you hang up pretty art in your living room. And I wanted it to be better organized. So it’s kind of like I had an interior designer and a professional organizer come in all at the same time! Now if only I could get someone to do this in my actual house. The Recipe Index is being completely recategorized so that you can narrow your search. Hopefully this will make it super easy to find exactly what you’re looking for. You will have to be patient with me here, because updating these categories means going through all 700 of my posts one by one. You will notice that some of the categories only have one or two recipes in them right now, but that will change over the coming weeks. I’m excited to now have a category for each holiday! She said she brings this Chicken Penne Pesto that her sister gave her a long time ago. I asked for the recipe and she emailed me the next day, “Hey Karen! Are you amazed I’m remembering to email you this recipe?? I am!” I was too! Most of the time when I ask for a recipe from someone I have to beg for it (like I did for a year to get these Bacon Baked Beans.) 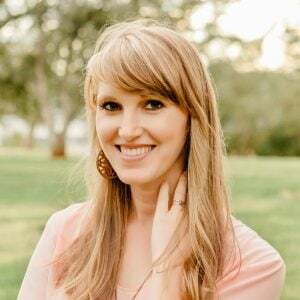 You are awesome Melissa! 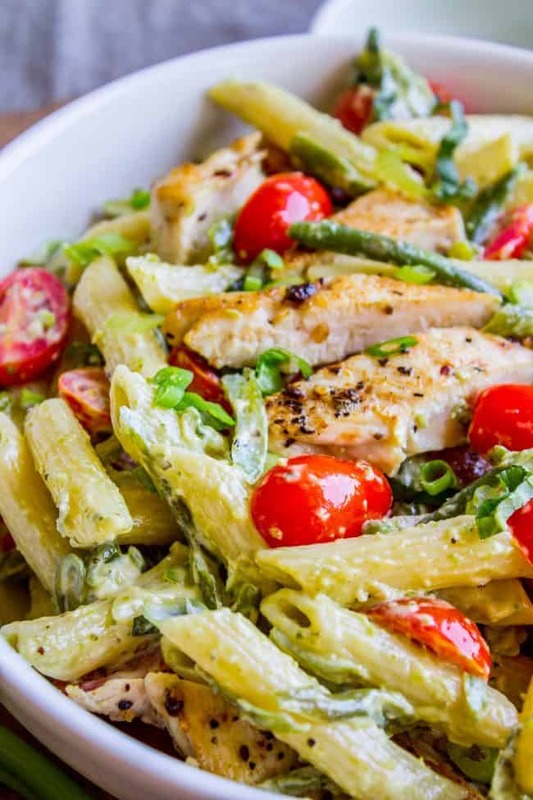 I’m in LOVE with this Penne recipe. It is so, so easy, and DELICIOUS. (Can you go wrong with a sauce made from mayonnaise and pesto? No. In fact, Melissa said this in her email, “If you’re one of those mayo-is-the-devil type people, I bet you could try plain greek yogurt. But it’s delicious with mayo, haha.” Nope, I am not one of those people! Mayo is one of God’s greatest gifts to the sauce kingdom. It’s the perfect weeknight meal for when you forget to plan dinner. Keep frozen green beans on hand, or you can totally swap out whatever veggies you have. I opted for browning a couple chicken breasts, but Melissa says she uses canned chicken most of the time. Sometimes you just gotta get er done, right? I am all over that. 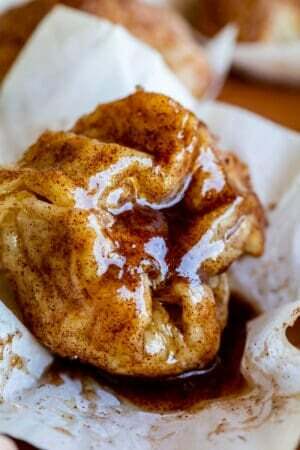 Let me know if you try out this recipe! Tag me on Instagram, #TheFoodCharlatan. And let me know what you think of the site design! (Also, tell me if you have any questions or see any errors on the site!) Happy Wednesday guys! Six years ago: Mexican Bean Salad << this one is a great summer side dish! 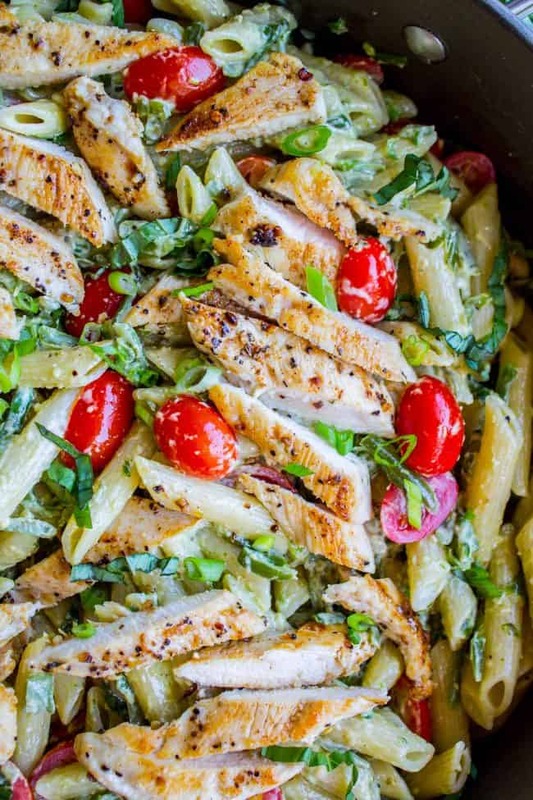 This 30 Minute Pesto Penne Chicken is your new favorite last minute dinner! It's done so quick, you can even used canned chicken if you are really crunched for time. 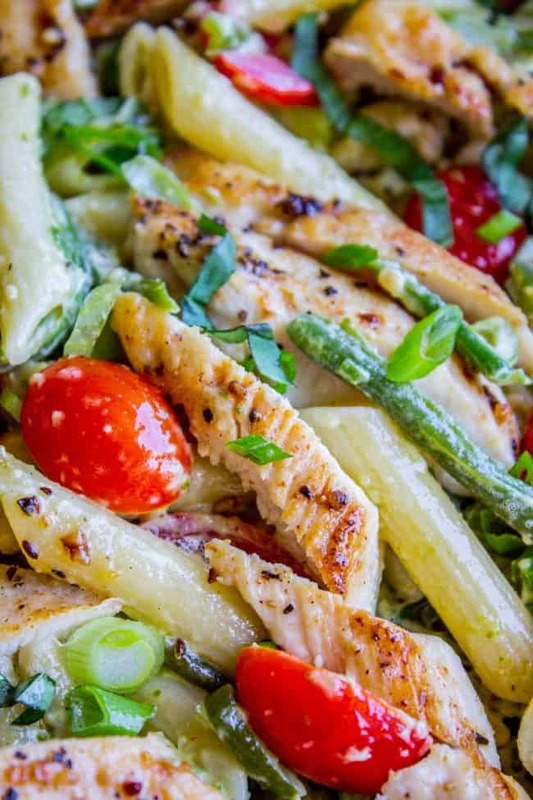 Swap the green beans and cherry tomatoes for whatever veggies you have on hand! Bring a large pot (or high sided skillet) of water to boil, adding about a tablespoon of salt (it should taste like the ocean). When the water is boiling, add the penne and set a timer for 5 minutes. After 5 minutes, add the frozen green beans. You don't have to use the whole bag, it's up to you. Set another timer for 4 minutes. Check the pasta and a green bean to see if they are cooked. You want the pasta al dente and the green beans just barely tender. When it is done, drain completely and return to the pot. If it's going to be a while before you add the sauce, stir in a couple teaspoons of oil. Meanwhile, prepare the chicken. 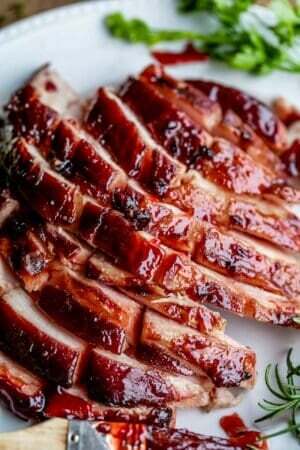 Slice each breast into thin strips, pat dry, and season with Lawry's and steak seasoning (you can just eyeball it). Heat a skillet over medium high heat. Add oil to coat the pan, 1-2 teaspoons. When the oil shimmers, add a few of the chicken strips (not all of them.) Make sure there is space in between. We want them to brown, not steam. After 2 minutes (or when you can see that it is brown), flip the chicken over and cook for one more minute or until browned. Continue until all the chicken is cooked. Set aside on a cutting board and let rest. Once it has cooled a bit, chop into bite-size strips. In a small bowl combine the mayonnaise, pesto, vinegar, salt, and pepper. Slice the tomatoes and shred the Parmesan. When the pasta is drained, add the sauce, tomatoes, Parmesan, and chopped chicken. Stir it up. Serve hot and garnish with shredded Parmesan. More easy pastas you could make for a quick dinner! I love summer salads! 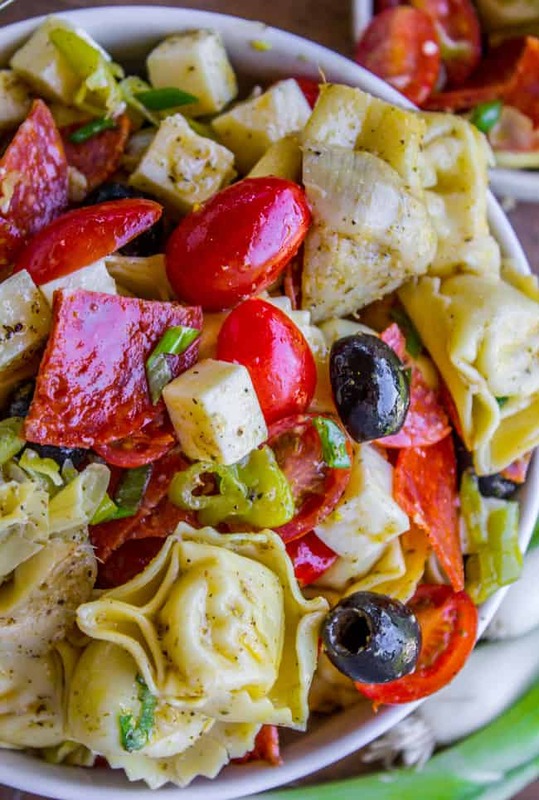 Italian Tortellini and Pepperoni Pasta Salad << perfect BBQ side dish! 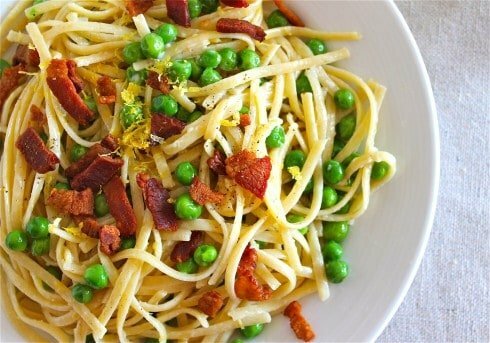 Creamy Lemon Pasta with Bacon and Peas << oldie but a goodie. 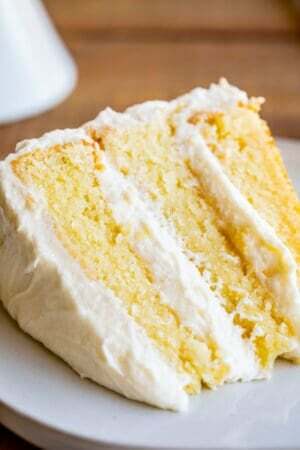 This recipe is originally from Heather Cristo. 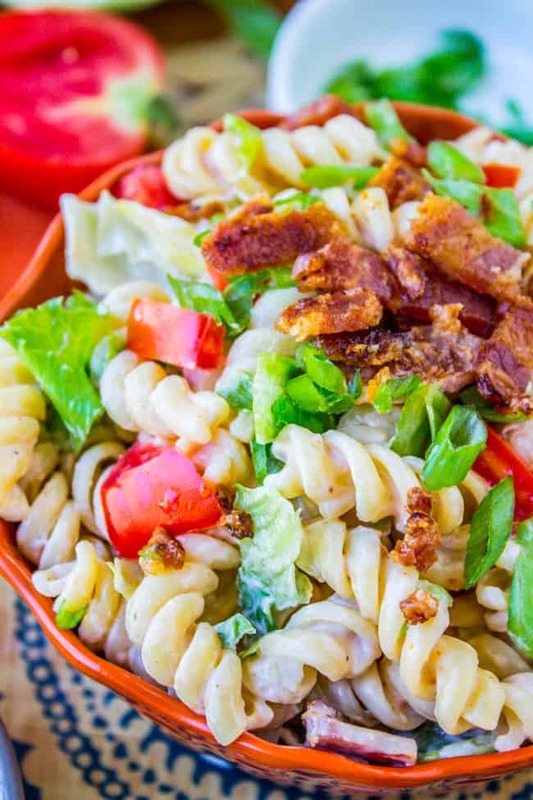 Easy BLT Pasta Salad << Love this one!! More quick and easy pasta dinners from other bloggers! I loved this recipe so much! I made it last night and decided to share it on my blog! Made this last night….WOW! Fabulous! I swapped fresh asparagus for the green beans, and light mayo for regular just to cut back on the calories a bit. You gotta make this! 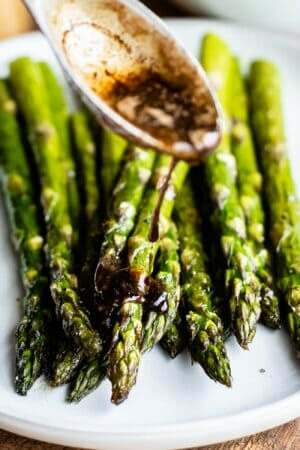 Ooh this would be so delicious with asparagus! Good tip Vicki! I’m so glad you liked it. Thanks for leaving a comment!! I made this for dinner last night and it was wonderful! I grilled my chicken after having marinating it for 5 hours and I used mini penne. This was truly a great dish – will be making this often! You make this recipe look GOOOOOD! Now I want to eat some. That’s how much I like this recipe, it’s been years and my family and I still love it! Hooray for fast easy dinners! Yay, thanks again for the recipe Melissa!! I can already tell this is going to become one of those all-the-time kind of dinners, my kids loved it so much! just wanted to say the redesign looks awesome, and so does this pasta!